My name is John and I like to grow large tropical foliage plants. It all started very innocently. I used to tend a small patio garden. You know the sort, 30 foot, mainly laid to concrete. It was manageable, a couple of narrow borders and a few pots. My gardening ambitions were limited to plants that flowered continuously. One day I received my first packet of Canna seeds. There was no warning on the packet. I thought they would be just like other plants. At first I thought I could handle it. I'll just keep a few, in pots. It wasn't long however before I wanted more. I did not just want more. I wanted them bigger, faster growing. The next thing I knew we were moving house. Moving to a bigger garden. Before long it was bananas, palms, bamboo. 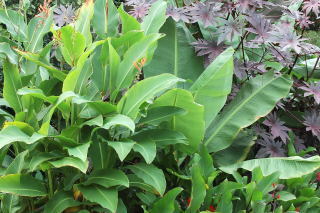 The death knell was a trio of second-season Ensete Ventricosum. There was no going back. I was hooked for life. Hooked to tropical foliage plants. Now I garden a zone 9, 100 foot, north facer. I've lost most of my friends. But to sit in the garden on a still August evening, surrounded by enormous plants that I've helped create, is quite a buzz. Over the years I have experimented with various tropical foliage plants and other exotics. Some worked some didn't. This site explains the methods used to raise and look after my plants. This does not mean it is the only way of doing things, far from it, but it is what works for me. As I said earlier, (in my dramatic opening paragraphs), I have an approximately 100 foot garden. The garden faces north. Save for a thin slice at the end of the garden, it is bathed in glorious shade during the winter months. I would classify the garden as zone 9. This indicates a minimum winter temperature of -7ºc. The Author (Me) in a clearing left by a felled ensete ventricosum.